It's picnic season! I have an amazing group of friends who regularly engages in what we call "competitive picnicking". It's not technically a competition, but we always win the day at the Stern Grove Festival or other local events with comfy low-back chairs, preparation and delicious food and drink. 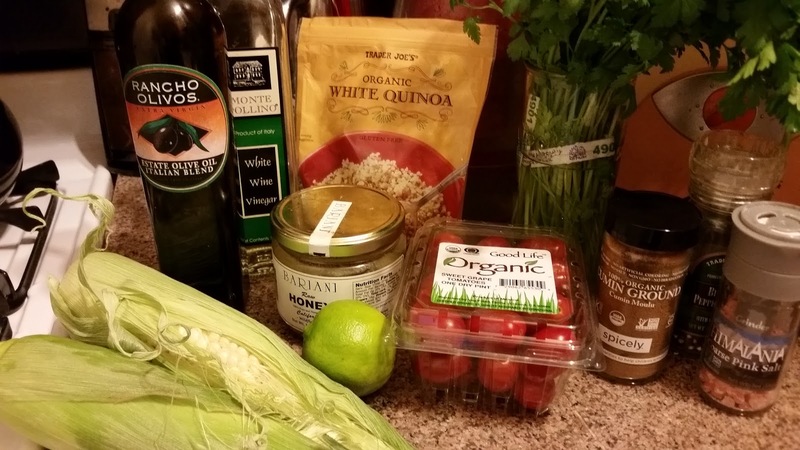 Last weekend, I quickly threw together a quinoa salad that I wanted to improve upon a smidge and share with you. It was inspired by the Quinoa Salad that flies out the door during every lunch rush at one of my favorite places in SF, Fleur de Sel. 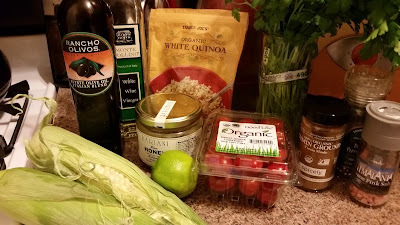 I realized it would take me a long long experimentation period to even come close to their herb vinaigrette, so instead I decided to use some lime with the summer corn and tomatoes. As always, every ingredient and amount is a suggestion. Hate cumin? Leave it out. Really really love cumin? Add a little more. No honey in the cabinet today? Use a little sugar. 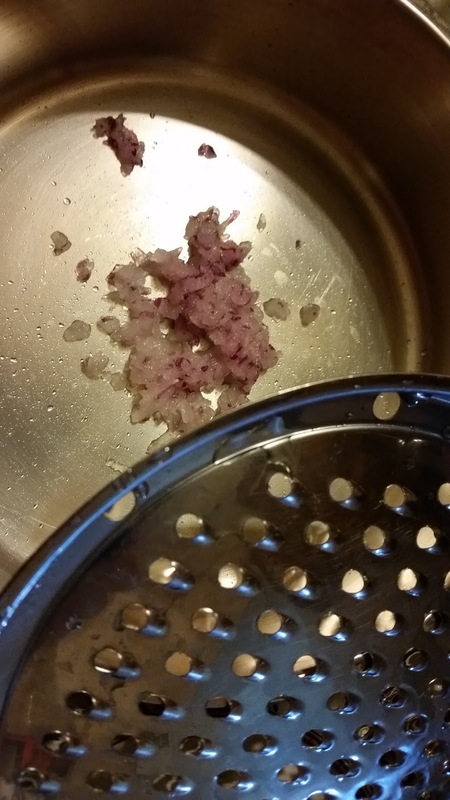 I like using grated onion because I like the flavor of the onion, but I don't always want to have giant pieces of it in everything. Teachers have to keep this in mind at certain times of the day! If you want lots of onion, add some fine slices to the salad instead. The tiny holes of a standard microplane are a little small to let much through, so I use a cheese grater for that. If you're taking the salad to a picnic, put the vinaigrette ingredients in a Mason jar instead of a bowl. Put on the lid and shake them up well. Test to see if it tastes good to you and add more of whatever you think is lacking. You can taste with a spoon or by dipping a little piece of lettuce or bread into the jar. Now, get the salad ingredients ready. Cook 1 cup dry quinoa (1 c quinoa, 2 c water, bring to boil, cook 15 min). I like white quinoa, but you could use red if you prefer it. It might need to cook longer, so check the package. Note: my dear Chilean friend would think me remiss if I didn't mention that the word quinoa should be pronounced with three syllables. It's kee-noh-ah, not keen-wah. While the quinoa cooks and cools, rinse and pat dry 1 c parsley leaves (or more, or basil, or cilantro, or arugula, or whatever you love). Leave on a kitchen towel to finish drying while you get the other stuff ready. 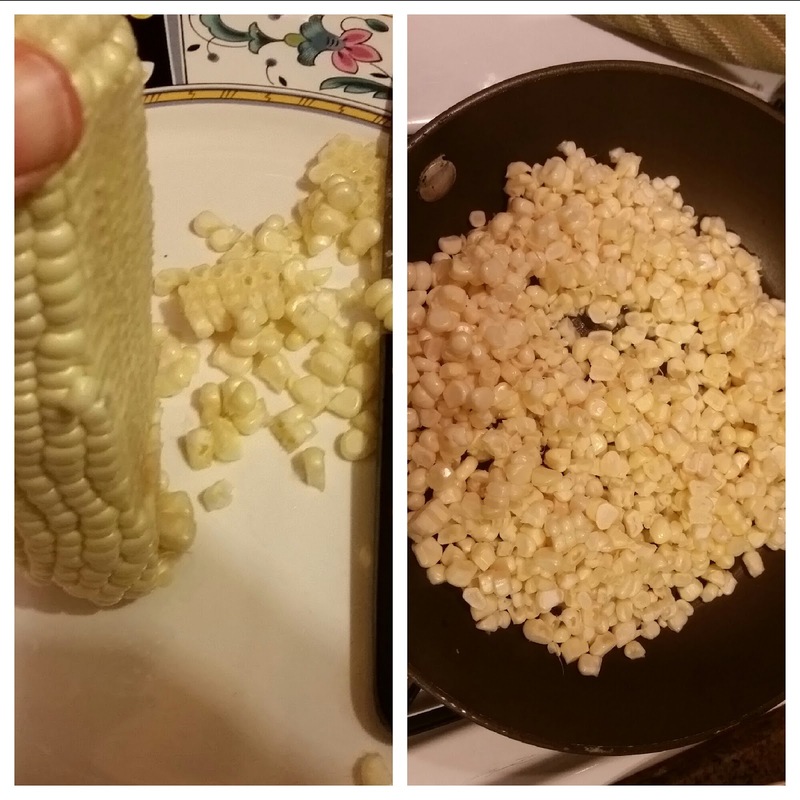 Prepare the corn: shuck two ears of corn and rinse to get rid of as much of the silk as possible. Stand the corn up on the stalk end and slide a knife from top to bottom to remove the kernels. Turn and repeat until all are removed. If this seems daunting or you're short on time, 2 cups of frozen corn would work here. Yellow corn makes a prettier salad because it contrasts with the white quinoa more, but white corn was on special at the market. Growing up in the Philly area, we ate TONS of fresh New Jersey corn on the cob every summer, rolled in butter and sprinkled with salt. Saute the corn ever so briefly, just a minute or two, in a teaspoon of olive oil or butter. 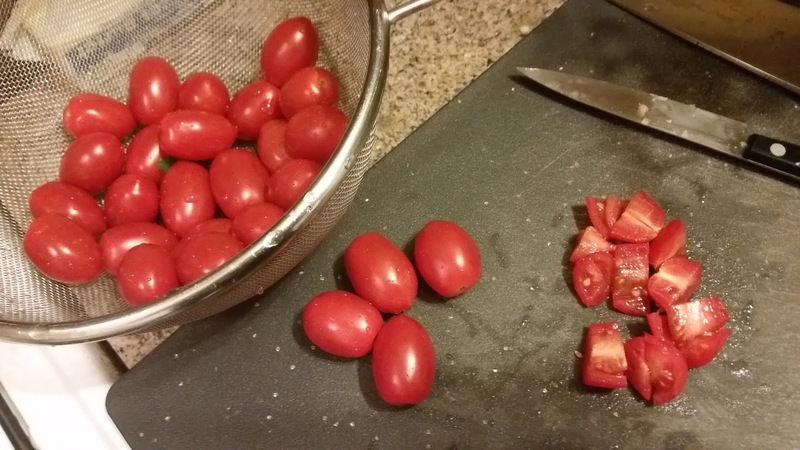 Wash and drain 1 dry pint cherry tomatoes (or two large tomatoes, or three medium tomatoes...you get the idea). Cut into a small dice. If these were round, I'd have quartered them, but since they're longer I cut them in six pieces each. You want them cut small because the quinoa and corn are small. These were SOOO GOOOD they didn't need it, but usually I'd sprinkle them with about 1/4 tsp of salt to bring out their flavor. 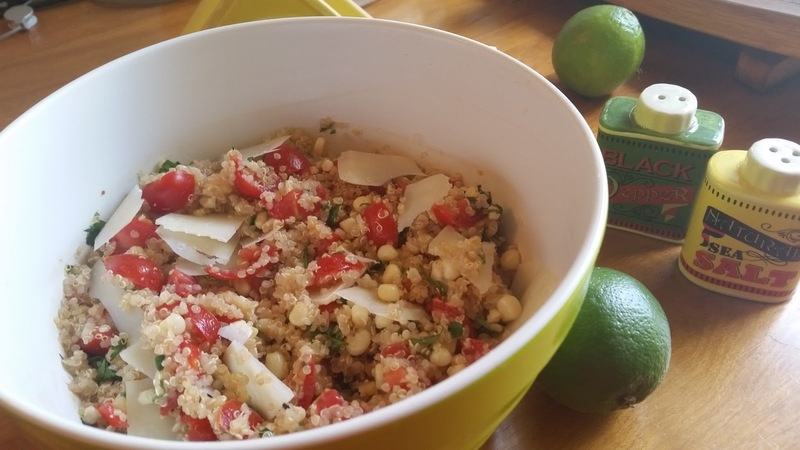 Put the quinoa in the bottom of a bowl big enough to hold everything with a little room to spare. 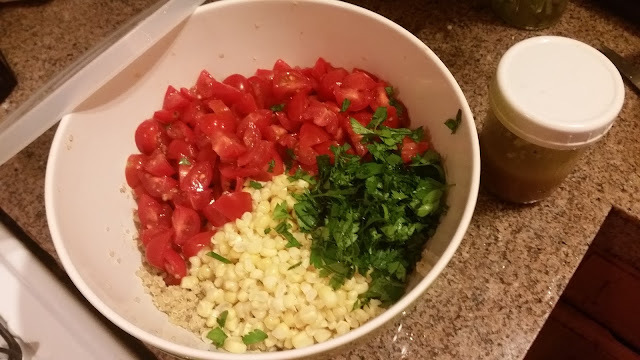 Chop the parsley and put that, the corn, and the tomatoes on top. Shave a little Parmigiano or Romano on top (not pictured - oops). If you're taking the salad to a party, put the lid on and carry the dressing separately. 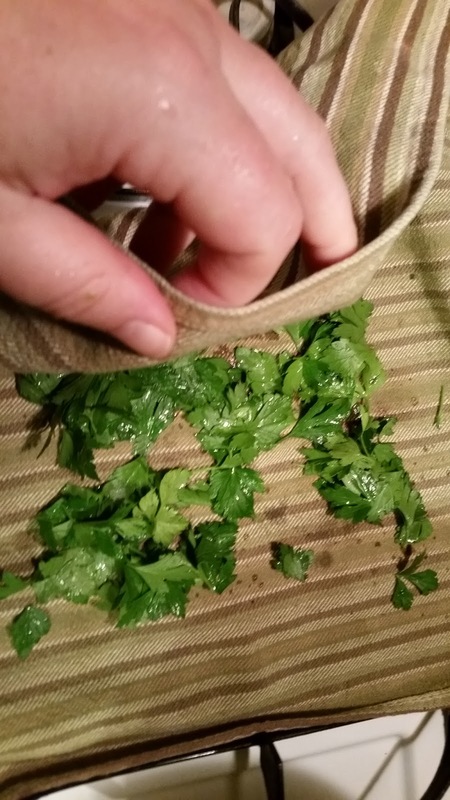 When it's time to serve it, pour the dressing over the salad, put the lid back on, and shake it up to toss. You might start with 2/3 of the dressing in case you don't want to use it all. Well YUM!! Tried this tonight with our garden basil. tomatoes & local sweet corn. Very good on a warm day. Definitely be having this again. My second time making this in two days. So simple, so good. Taking it today to a pot luck barbeque. This salad is the essence of summer deliciousness and healthy eating!